Other conflict management skills training and consultancy in designing conflict management systems. We are always interested in developing working relationships with new organisations so please contact us (Tel.020 3371 7507) if you would like us to work with you to develop and supply effective conflict management responses within your organisation and/or with your users/customers/clients. Below are some of our partner organisations and a description of the nature of the work we do with those partners. In November 2013 CAOS Conflict Management trained a team of Mediators for Open Door Thurrock - a lively and innovative charity based in Thurrock. Open Door Thurrock works with young and vulnerable people, helping them overcome their barriers and achieve their potential. "Fantastic training, met my expectations and more. Feel confident in mediating." CAOS Conflict Management helped University of Plymouth to set up a University Student Complaints Mediation service, providing Mediator Training and Continuing Professional Development support as well as consultancy regarding appropriate management of the service. 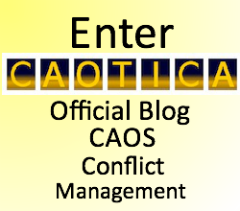 CAOS Conflict Management provides mediation in staff related difficulties for The School of Oriental and African Studies (SOAS) which is part of the University of London. CAOS has provided Teambuilding and Conflict Awareness training for staff at Broadacres Housing Association based in Northallerton, North Yorkshire. CAOS Conflict Management established a working relationship with St Ethelburga's Centre For Reconciliation and Peace, based in the East End of London, through which CAOS provided Group Conflict Coaching sessions, in November 2011. "Our distinctive approach is to create new transformative opportunities for people to explore difference, division and disagreement safely and creatively." CAOS provided Mediation Skills Training for Bedford Borough Council for Council staff to mediate in community and neighbour disputes. We provided our 6-day Mediation Skills Training Course in Bedford during Decembrr 2011. Please contact us (Tel.020 3371 7507) if you would like to work with us as a new partner organisation. We would very much like to hear from you.